Q. How do I find an industry report? You can access industry and annual reports by using our ABI Inform Database. The reports in this database contain similar content to Standard and Poor's industry reports. To access these reports in ABI Inform, go to library.hiu.edu > Find Items > Research Databases. Using the drop down menu, select "Business and Management" and from there you can choose ABI/INFORM Complete (ProQuest) (you will be prompted to log in with your HIU email and password). In addition to journal articles, this database also contains country-and industry-focused reports and data. Once on the advanced search screen you can enter your search terms into the top box. You may need to experiment with your terms (i.e. if you are looking for film and television entertainment, video games, etc.) in order to narrow down the reports to your desired focus. Alternatively, you can also look up specific companies using the filters underneath "Company/organization." 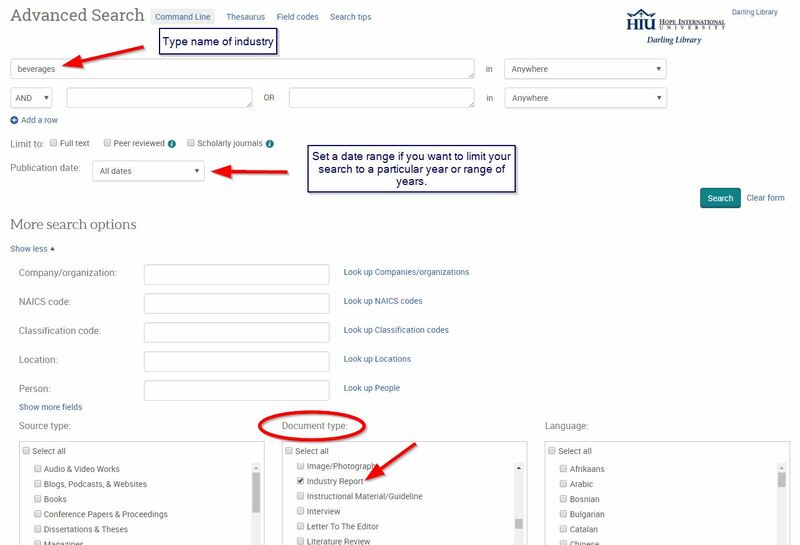 Before searching, limit your search to retrieve Industry Reports under "Document Type." You might also want to consider limiting your search to a specific year or range of years by selecting from a date range under "Publication Date". Once you have set these parameters you can select "Search" at the bottom of the screen to pull the results that are limited to industry reports only.